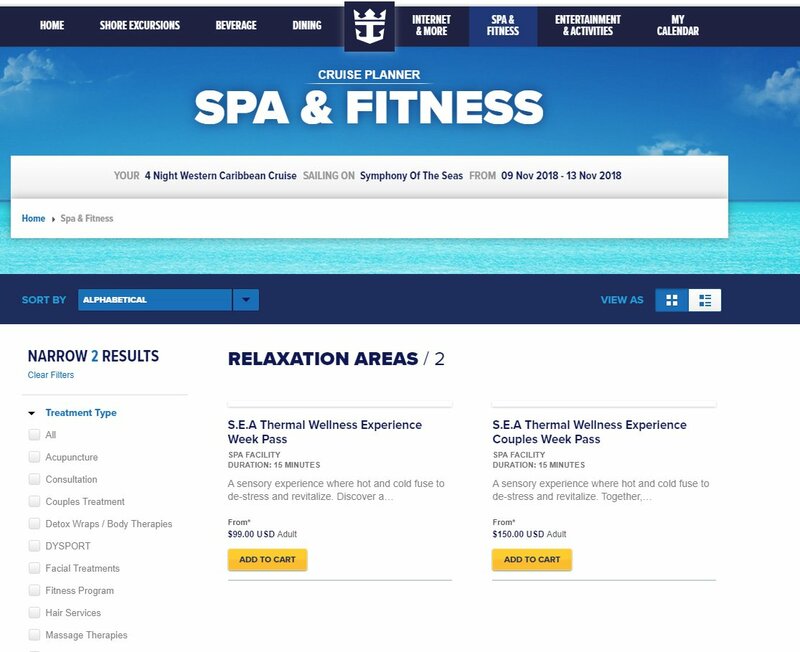 It appears that guests can now pre-purchase thermal spa access via Royal Caribbean's Cruise Planner site. Up until now, passes to the thermal spa were only sold onboard the ship. A new "Relaxation Areas" subcategory has been added to the Spa & Fitness area of the Cruise Planner, with two available options: S.E.A Thermal Wellness Experience Week Pass and S.E.A Thermal Wellness Experience Couples Week Pass. Shoutout to Royal Caribbean Blog reader firebuck for alerting us to this new option. Only Royal Caribbean's Oasis, Quantum and Radiance Class ships offer a thermal spa, and we have spotted this new option for sale on select Symphony of the Seas, Anthem of the Seas and Brilliance of the Seas sailings. This new option may not be available on all ships or sailings, so check the Royal Caribbean Cruise Planner under the Spa & Fitness tab to see if it is available on your upcoming cruise. The Vitality Spa and Fitness Centers on board Royal Caribbean's ships give guests the chance to rejuvenate the mind, body and soul. The relaxing escape offers everything, from signature facials and bamboo massages to manicures, a hair salon and even a medi-spa. With the added benefit of a full-service fitness center, complete with state-of-the-art equipment and a lineup of workout classes, travelers can easily find the balance to maintain their healthy lifestyle while on a vacation. If you are in the market for a fantastic guilty pleasure for your next Royal Caribbean cruise, be sure to check out the Thermal Suite in the Vitality Spa. This ultimate adult retreat offers unlimited access to warm loungers, steam and sauna rooms, and more. It is a fantastic way to relax while at sea. Royal Caribbean offers a Thermal Suite on some of its ships, including Harmony of the Seas. While aboard Harmony of the Seas, we took at tour of the venue to get a sense of what this is all about. Royal Caribbean sells a limited number of passes to the Thermal Suite on every sailing. Passes can be purchased onboard the ship at the Vitality Spa, and provide unlimited access to the facilities included with the spa. The thermal suite is made up of a few areas that allow for relaxation as you see fit. Unlike a massage, facial, or other service in the spa, guests can come as often as they like to take advantage of the thermal suite benefits. It is the perfect way to relax and treat yourself at the same time. The thermal suite has the following amenities that can be used only by those that purchase a pass. Keep in mind that while the pricing refers to "couples", in reality, it means any two guests can take advantage of it. Friends can book the couples option and take advantage of reduced pricing. 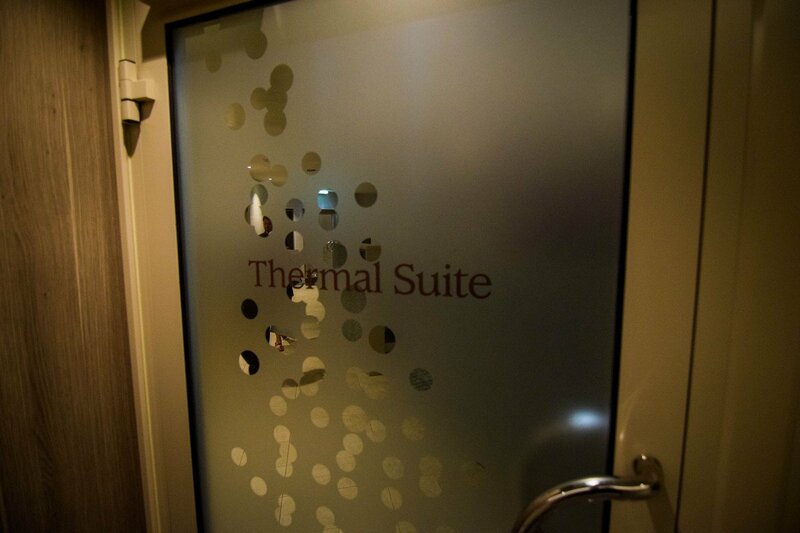 Guests can purchase their thermal suite passes from the desk at the Vitality Spa. It is best to purchase them on embarkation day. Royal Caribbean is offering up to 30% on select spa services reserved through the Cruise Planner on most cruises that guests have booked. Not all services offered by the spa include a discount, but there are quite a number of discounted options to choose from, including deep-tissue massages. The 30% off deal mentions this is a "limited time offer," although there is no indication of when the discount will expire. Keep in mind that anything pre-purchased via the Cruise Planner is 100% refundable before your cruise begins, so there is little risk in purchasing it under this deal and deciding later to keep it or not. This is the first time we have seen discounts on spa services, although up to 30% off deals have been spotted on drink packages and internet packages. Would you book a spa service if you received this kind of discount offer? Share your thoughts in the comments! Cue the lavender scented oil, because we are talking about the ultimate means of relaxation on a Royal Caribbean cruise: the Vitality Spa. 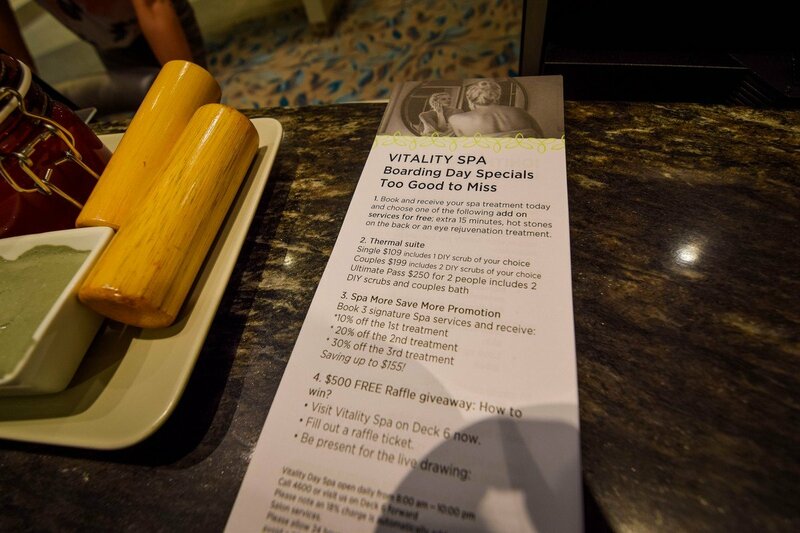 Every Royal Caribbean ship has a Vitality Spa location, which offers guests services, seminars and treatments that are aimed at making you feel better, look better and be healthier. The exact size and range of services will vary from ship to ship, but there are important considerations to know before stepping foot inside. 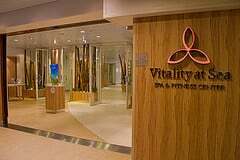 Royal Caribbean's Vitality Spa offers quite a variety of services. 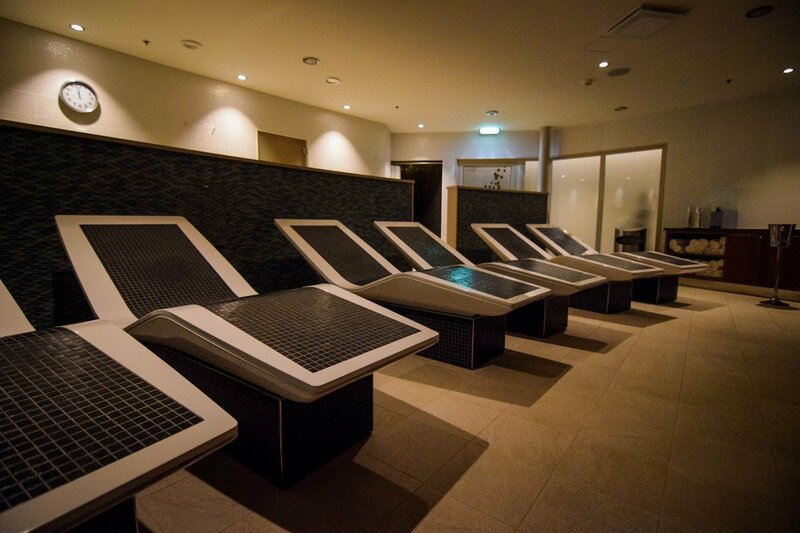 Typically, the spa is split into three main areas: the salon, the treatment area and the fitness center. The salons will typically offer manicures, pedicures, waxing, hair styling, barber services for men and more. In the treatment part of the spa, guests can choose from deep-tissue massages, acupuncture, bamboo massages, teeth whitening, Botox, detox services and much more. A full list of spa services will be available once onboard your ship, although you can also get a pretty good idea of what is available by browsing the spa services listed on Royal Caribbean's Cruise Planner site. 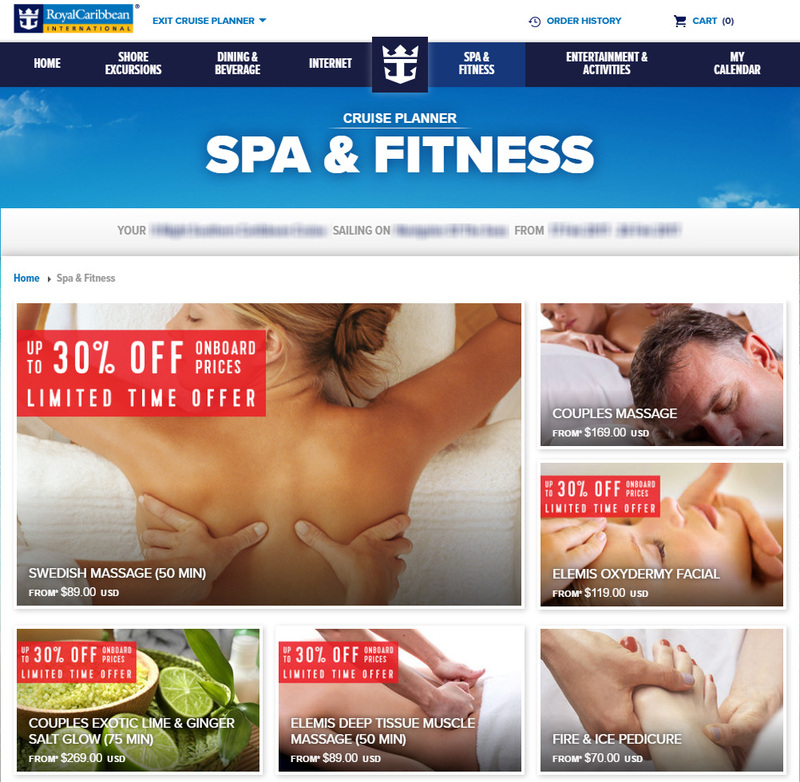 Royal Caribbean allows guests to reserve spa appointments either online before a cruise or once onboard. Booking spa services online in advance of your cruise will help break up the total cost of the cruise, as well as guarantee an appointment for a specific day and time. It is important to note that spa services are rarely discounted prior to the cruise. 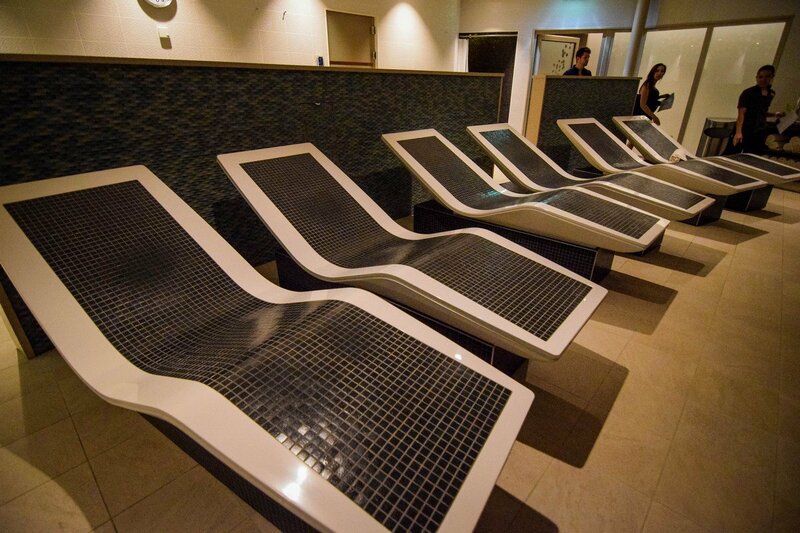 Most guests tend to book spa reservations once onboard the ship. Slots do tend to fill up as the cruise progresses, but if you are flexible with appointment day and times, you can often find availability. Each day, the Vitality Spa will offer some sort of discount or package deal, with the most lucrative deals often on port days. Regardless, these specials are only available for booking the day they are offered. Reservations for the spa onboard the ship can be made at the spa entrance, by calling the spa directly from a courtesy phone or by contacting suite or Diamond concierge attendants. If you want to have a service performed on a certain day or time (such as getting your hair or nails styled prior to formal night), reservations made as soon as possible are recommended. Keep in mind that it is customary to provide an additional gratuity for services performed at the spa. Generally, Royal Caribbean will add an 18 percent tip to the receipt when paying for the service. You do have the option of providing an additional tip if you choose, but it is not required. Royal Caribbean sells day-passes for this service, which offer unlimited access to the thermal spa. These passes are limited in quantity to prevent overcrowding. 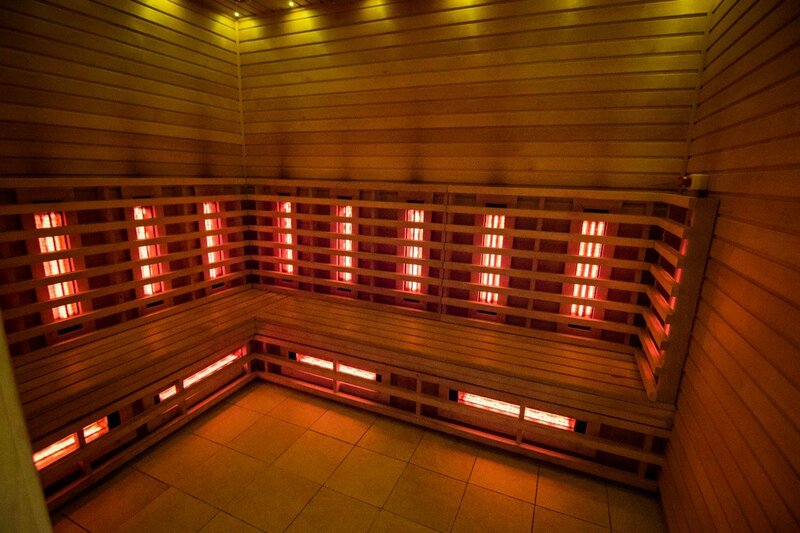 The Thermal Spa option is available on Radiance, Oasis and Quantum class ships. On Royal Caribbean's Oasis-class ships, the Vitality at Sea Spa and Fitness Center includes a separate YSPA (teen spa) area. The YSPA offers treatments and services for guests that are 13-17 years old. YSPA menu has facials, massages, nail and hair treatments. Sample treatments available in the YSPA are Acne Attack facial, Beach Babe deep conditioning hair treatment, Sole Mate pedicure and more. Just like the adult area of the Vitality Spa, treatments at YSPA have an additional charge per service. Tours are available at anytime of the spa, but try to take a tour on embarkation day when they are the easiest to take. You can often ask the Spa staff what the specials will be in the days ahead. You might not be able to book it, but at least be aware of what specials will be available later to book. There are certain activities held at the spa with no additional charge. Theses events may have a sales-pitch to them, but there are some complimentary seminars and evaluations offered. Note the name of a crew member that performs a service at the spa that you like, so if you return, you can request that person again. Onboard Royal Caribbean's Oasis of the Seas, guests can purchase something called the ultimate thermal suite pass. Royal Caribbean Blog reader Christie McLarty decided to try it for herself and share the experience with everyone! We purchased the ultimate thermal suite pass for two for the week. The cost was $250, and included use of the razul/mud room and a private jacuzzi (later referred to as bathing suite). You had to schedule these with the spa and each lasted an hour. For both services, you check in with the front desk and wait in the relaxation room until a staff member brings you to the room and explains everything in detail before leaving you alone for the remainder of the time. They knock on the door when you have ten minutes remaining. The razul room consisted of a few steps to exfoliate and cleanse the skin. The first was a salt scrub. You apply this to yourself or your partner and then rinse it off in the shower. Afterwards, you apply several facial cleansers and masks from Elemis. These were slightly confusing because the directions on the back of the bottle were for the spa, not for an average consumer such as "apply as per Elemis training." We tried to figure out what to do with each one. Next, you apply a thin layer of the green mud mask to each other or to yourself. 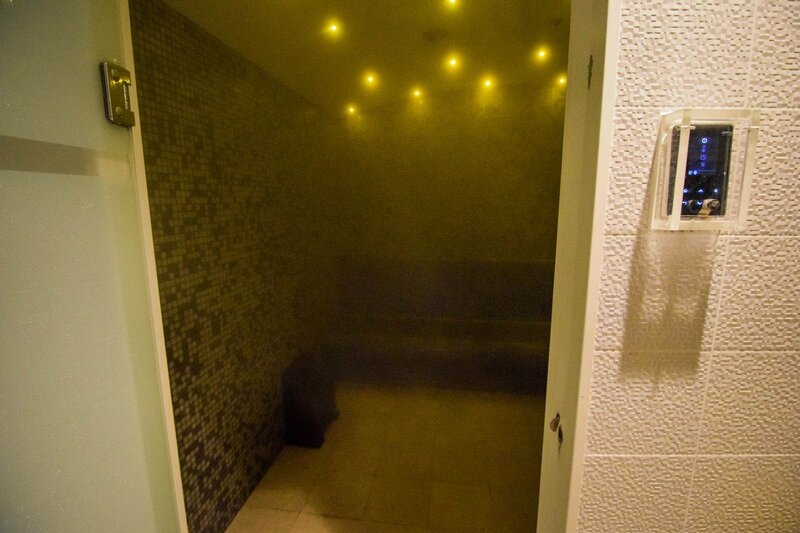 You then sit in the steam room for about 15-20 minutes. It goes through several cycles of steam until a nozzle at the top kicks on and washes the mud off of you. If the nozzles don't get all the mud off, there are spray shower heads to finish rinsing off. There are towels and robes to use afterwards. The mud mask had a cooling effect similar to icy hot. The jacuzzi was more like a two person private bathtub. She stated that she put elemis detox products in the bath and this may cause us to sweat. She showed us how to operate the tub and then left us alone. There was a shower to use after and elemis facial products left out as well. Since we had just finished with the razul treatment, we skipped the facial cleansing. I brought an iPad and we caught up on some shows that I had downloaded. It was very relaxing and I would definitely do it again. Hope this helps someone! Royal Caribbean has reached an agreement with Steiner Leisure Limited to be the exclusive provider of spas, salons and fitness centers and related beauty, wellness and medi-spa services and products on Royal Caribbean vessels currently sailing, as well as the Quantum of the Seas and Anthem of the Seas, scheduled to enter service in 2014 and 2015, respectively. Condé Nast Traveler released its list of the top spas around the world and in the case of the best spas for cruise ships, three of Royal Caribbean's onboard spas made their Top 25 list. Royal Caribbean's Liberty of the Seas (9), Grandeur of the Seas (16) and Allure of the Seas (20) all ranked in the top 25. The list of the best spas ranked them by treatments, staff & facilities. The polls results came from Condé Nast Traveler readers who shared their findings with the web site over the course of the year. There are just some things that go hand-in-hand with going on a cruise - umbrella drinks, hair braiding and the spa. Every Royal Caribbean ship features an onboard Vitality Day Spa and Fitness Center that offer a variety of services that you can purchase to help relax, ease tension, make you look/feel better or just plain splurge. What can I have done at the spa? Who can use the spa? The spa is open to anyone at least 18 years old or older. There are also services available for passengers age 13-17 called the special YSPA menu for teens. You will have to inquire at the spa for more details on teen programs. 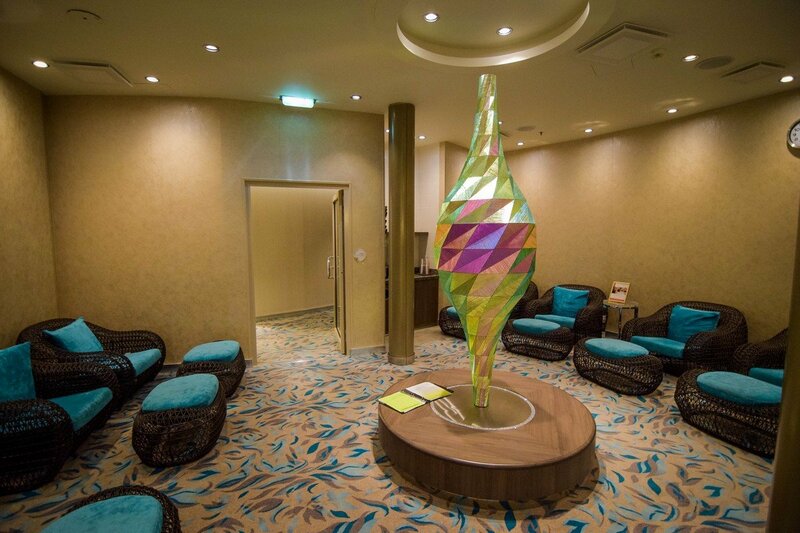 The Vitality Day Spa usually offers free tours of the spa, especially on embarkation day. On your first day of your cruise, you can usually drop by and get a tour and see the facilities as well as hear descriptions of what's available on your cruise. We've found these tours to generally be fairly low sales pressure and it can be a fun activity for the family to look at. In addition to the tour, you can speak with a spa staff member about what you're interested in. Given the slew of treatments and services available, there's a lot to choose from and everyone's needs are different. Spa treatments are a nice perk for yourself or someone you're with. They cost extra and some can cost as much as a few hundred dollars. They are far from a necessity but many cruisers love to take the opportunity to indulge in one. You must make a reservation for a spa treatment at the spa desk or by calling the spa. Generally speaking, the spa books up quickly on sea days and is easier to get into on port days. You may also book the spa online prior to your cruise via the Royal Caribbean website. How much do treatments at the spa cost? Prices for spa treatments vary and can change often. While we can't quote you exact prices for your cruise, we can give you some ball park ideas of what prices will roughly cost. Keep in mind, these are generalizations and your actual cost may be less or more. It is customary to tip the person who provided the spa services to you after your treatment is complete, but be sure to ask if gratuity is already included in the price they quote you. Often gratuity is included and while you may tip extra if you feel the service was extraordinary, it isn't necessary.